Pic(k) of the week 48: Hard night in Madrid? As often is the case, while shooting, I felt that a lot of them would be turned into Black and Whites. Using the dark blue sky with a red or orange filter (using Silver Efex Pro) I feel like Ansel Adams! Click here to view my Madrid images. My Pic(k) of the week above, of three sleeping guys, was secretly shot in a park near Plaza Espagna, Madrid. I believe that the harsh contrast between the dark shadows and the bright sunlight breaking through the tree branches, makes for a nice Black & White photograph. Just as I framed a third image of the scene, the center guy woke up and did not look happy! Not sure if they really were recovering from a hangover, but it kind of felt like it to me! Lately, I seem to be in my night photography mode... I had marked yesterday as "full moon photography" in my calendar. And so I did ! For those of you that are not up to speed with the Lunar phases, on a full moon night, the moon rises at about the same time as the sun sets. Of course on opposite sites! Normally a good moment to photograph a moonrise. Using the iPhone app "Magic hour" (the former Vela Clock), I determined that the moon was rising at 1759 at an azimuth of 063 deg (close to East North East). Before leaving home, I used Google Earth to find a good spot to photograph with a desert background. About 15 mins before the moonrise I was all set up. Perfect timing. While the moonrise images were fine, it did not make it to my Pic(k) of the week. Click here to see an example of it. 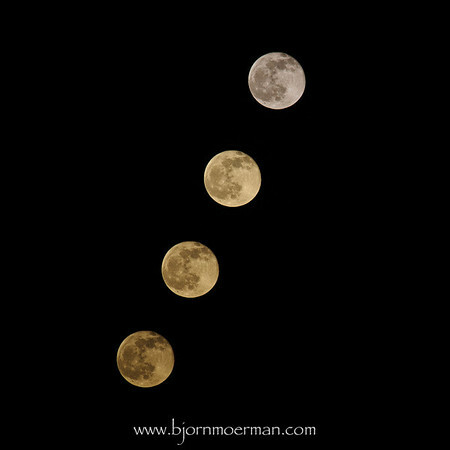 While the moon was climbing above the horizon, I decided to do a 4 exposure moonrise image without the desert background. The image is straight out of the camera, using the "image overlay" function in the retouch menu of my Nikon D700. To be honest, this was the first time I used it and I'm very pleased with the result! One basically needs to fix the camera on a good tripod and then take several timed exposures. Activating a function on the camera then merges all images. I used 4 minutes between all 4 exposures. The final image reminds me of the game, "Four in a row". One can see the change in color and brightness as the moon gets higher. This has to do with the amount of atmosphere the moonlight has to cross. A low moon crosses through more dust and atmosphere than a high one. More info is available here. For a long time, I've been after a specific moon shot. Until today, I still do not have the shot, but yesterday I did come close... 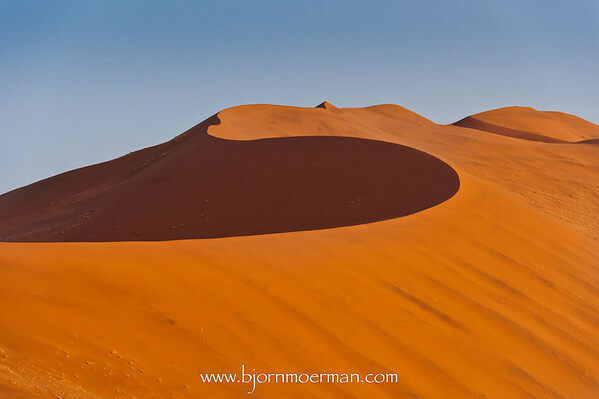 Check out the Bjorn Moerman Photography Facebook page for more! Last Thursday was our 4th get together of this years winter season! 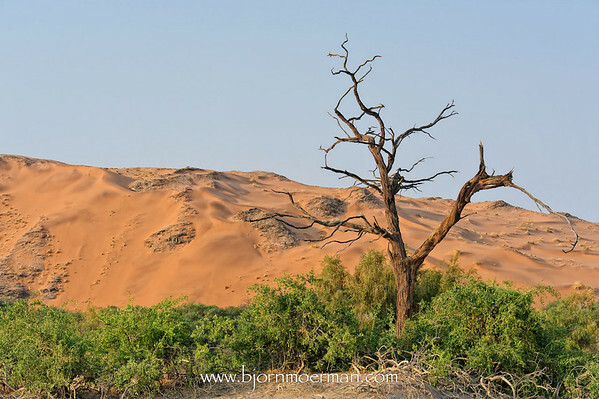 The shot below is made at our Belgian BBQ spot ( 50km SE of Dubai ) about 4 hours after sunset. I'm always amazed how much light a full moon gives us! No flash used. Only a little bit of light painting onto my car with a small flashlight and of course a sturdy tripod for the long shutter speed. To finish it off, I switched on the car's interior lighting. If you like it, feel free to have a look here at some more moonlit images made the same night! 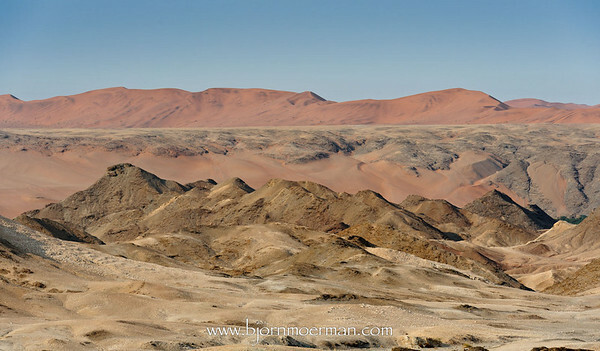 All of the Namibia -Beauty and the Beast- images can be found here. We ( my wife also actively participated in the planning ) started preparing for the Namibia -Beauty and the Beasts- trip early 2010, leaving date-8 months. Pretty early we decided on the way of transport within Namibia, since a lot of the further planning depends on it. The decision was made to rent a 4x4. Even though a lot of the stuff is accessible by normal saloon car, I do definitely not recommend to do it that way. Most roads (>90%) are gravel and sand roads and a car with good traction control and increased ground clearance makes the trip much safer and more comfortable. If on a tight budget, a little Kia will do the job just fine. Next we had to decide on our overnight stays. In most places there is a large selection of lodges available ranging in price from mid range to very expensive. We wanted to combine a bit of camping with some lodge overnights. So it quickly became evident that our best option would be a 4x4 with a rooftop tent. Even though none of us had travelled with one of these before it turned out to be a great experience. The tent large enough for two adults, is comfortable and sets up in less than 5 mins. Actually, some of our best nights sleep were in the tent! Now that we knew what to drive and where to sleep, it was time to start the road planning. 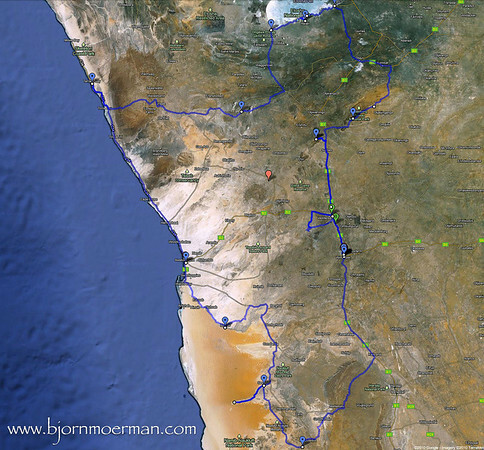 Early 2010, I found a very detailed classic Namibia paper map while over on a trip to South-Africa. Next, a website called www.namibian.org also proved very useful. They are a tourist agency based in Windhoek and have different online tours varying from a few days to almost 3 weeks. We ended up combining different tours and booked a tailor made 14 day tour (click above for more details)) with them just under three months before leaving. Booking early turned out to be wise since some of the more popular lodges like the ones in Etosha and the Sossusvlei lodge fill up quickly. Even outside the school holidays. We had used the Lonely Planet books for our adventurous travels in the past and were once again not disappointed! Further on, I used the power of Google Earth extensively in order to check on small things we couldn't find in any of our travel guides. A few months before the trip, I got a 64GB Apple iPad 3G. This together with the application GPS Motion X was extremely helpful for the navigation on the road. It allows one to download Google Earth maps and use them with the iPad's GPS, which strangely enough only comes with the 3G version. On the main roads signs are fine, but it just makes live so much easier with a good electronic map. 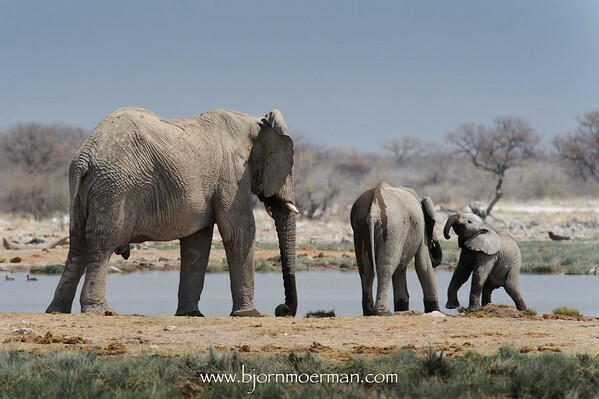 As an example, at home I downloaded a list of all Etosha waterholes GPS coordinates, which made it dead easy to drive from one animal drinking place to the next one. Always make sure you are familiar with entering coordinates in your device, be it an iPad, iPod, Garmin or any other GPS unit. As always when traveling on the airlines, there is a limit to the amount of hand luggage that one can bring on board. Except for my tripod, checking in expensive camera gear is a big no-no for me! The limiting factor on the 4 sector flights (DXB-JNB-WDH-JNB-DXB), turned out to be the one piece of hand luggage per person (max 12kg) on the South African Airlines flights between Johannesburg and Windhoek. I know my loaded camera bag (Lowepro Compu Trekker) often flirts with the 25kg mark on the scale... Only option to keep it below the limit was sharing a second bag with my wife. Needless to say, one has to plan and weigh this beforehand! While on the trip I downloaded my CF cards every night to my Macbook AND to my external hard drive. Both I always kept in different places. Just in case! I only reformat the cards whenever I'm short of space... So for most images I had three copies. The golden rule of image backup. During the planning phase I was slightly worried about the amount of dust in Namibia. If one resists from changing lenses outside, he/she should be fine. To be honest I did only clean my sensor once with the dry solution (Visible Dust Arctic Butterfly) and waited to give it a wet sweep until back in Dubai. The in camera dust removal is surely I good invention! I initially hesitated to take the tripod with me, but in hindsight was glad I did. It proved to be very useful for nighttime photography at waterholes and I really enjoyed my first time star trail experiments. Would I do it again? Absolutely. No doubt! 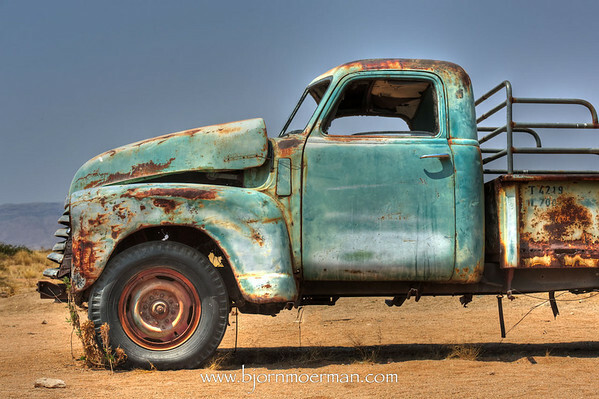 Driving a 4x4 from Windhoek to Cape Town to explore Southern Namibia is on the list as well. But as always, the list is long! A special thank you to my wife Djamila, for all help with the planning and the overall support. Thanks! NEED TO ENJOY LIFE TODAY AND NOT TOMORROW! 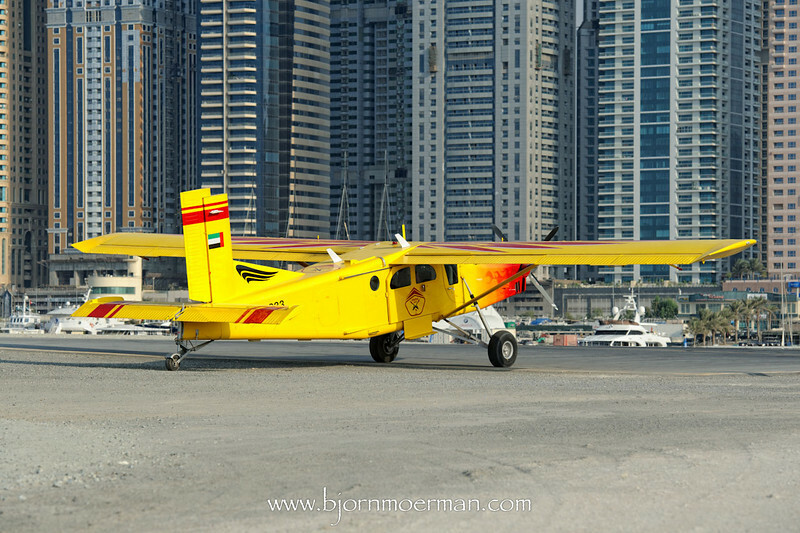 A few days ago I was out at Skydive Dubai, the new parachuting club at Dubai Marina. In a previous life, I used to fly with skydivers for more than 10 years, at Moorsele, Belgium, now called Paraclub Vlaanderen or PCV. So even though I never dared to jump out of a perfectly good aircraft, I'm quite familiar with the exciting world of those strange falling people from the sky! 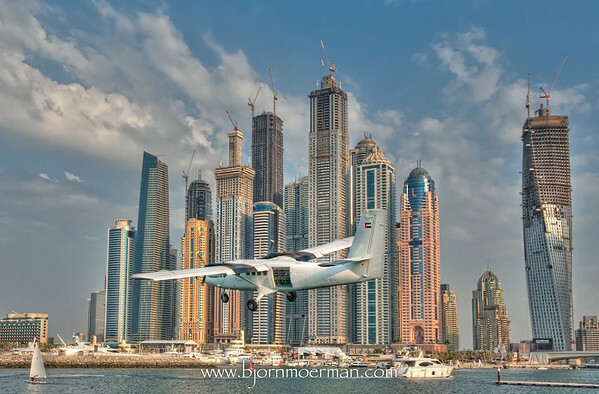 Skydive Dubai, less than 2 years old, is growing fast. They use a brand new Pilatus PC-6 and a de Havilland DHC-6 Twin-otter. 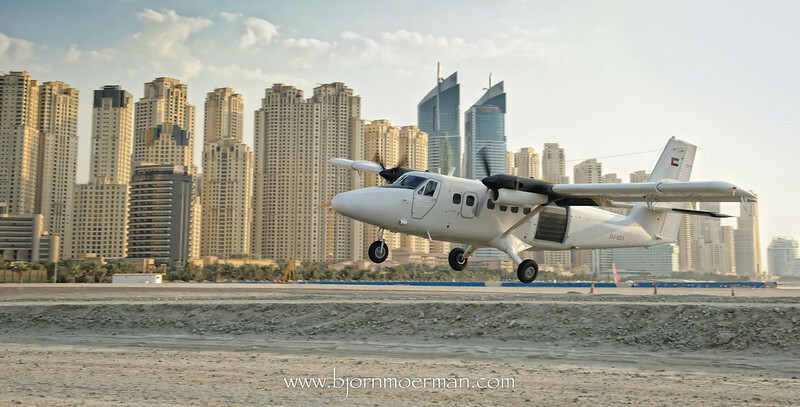 The image above, is made just after the Twin-otter took off from the short airstrip next to the Mina Seyahi Beach resort with a fresh load of skydivers. More of my "Skydive" images here. Pic(k) of the week 44: The desert is on fire! As a continuation of last weeks Pic(k) of the week, another image from the desert! This time of fire-spitting Kris from Belgium. Last year, Kris and his family came over to Dubai for a weeklong visit and did a great fire-spitting (fire-breathing) performance at the end of a desert drive and BBQ. This year they are back and yesterday he kept the tradition going! Out of the three images I posted on the site, I do like his facial expression on this one the most. Making images of fire-spitting is surely a bit of a challenge. The amount of available light changes a lot in a split second. Shooting in Manual mode is a must ! The D700 keeps surprising me... low light, high ISO performance is just amazing. ISO 3200 and no noise at all! This for a body that is more than 2 years old! 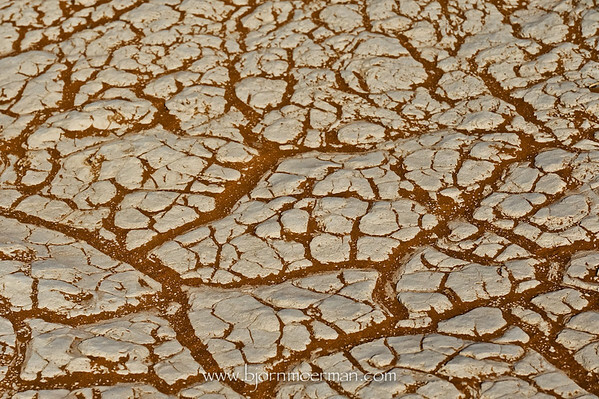 More of my desert life images can be found here. Leaving Swapkopmund, the ex-African/German city at the Atlantic Ocean, behind us, we were now headed into the oldest desert of the world, the Namib desert! Miles away from any form of civilisation, we overnighted at the Homeb campsite. In the middle of an oasis along the dry Kuiseb riverbed, there is a very basic site with one water tap and... that's about it! 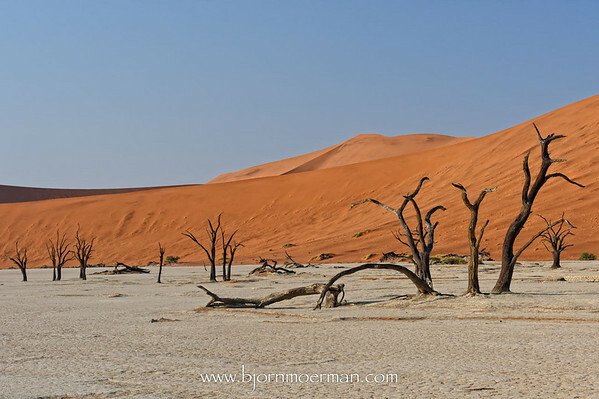 The goal of our next day was getting to a must see for all Namibia visitors, Sossusvlei. One however has to make a stop at Solitaire, a small community consisting of a petrol station, garage, bakery and cafe. The place really became known after Ewan McGregor and Charley Boorman stopped there on their "the long way down" motorbike tour in 2007. 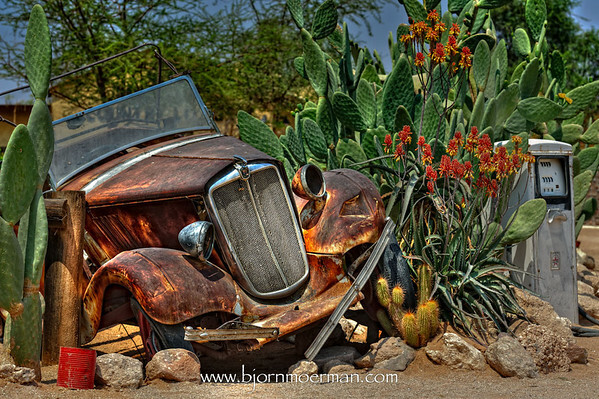 I did enjoy shooting some HDR images of the dis-used cars parked at the entrance like this Morris Eight. The park is known for its amazing dunes and its early morning colors are just breathtaking! I've seen quite a few dunes in and around Dubai, but nothing compares to this! 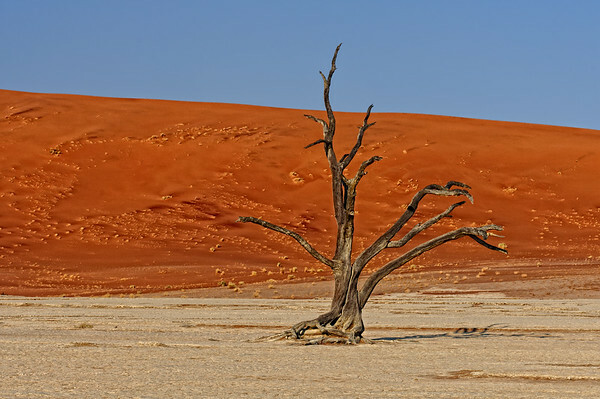 Because the water never gets far enough into the valley, all trees in Dead-vlei have died. An estimated 900 years ago! Yes, that's right! What makes the place even more special, is that there is not even enough humidity for decomposition. So although dead,these trees have been perfectly preserved for centuries. The great adventure was almost over! We ended up spending one more night at the excellent Namib grens campsite (see star-trail post earlier) followed by a last day in the capital Windhoek. I'll be writing some closing thoughts on this series in a last blogpost later this week.